At a point in time when families are becoming busier every day, there are a lot of excuses floating around as to why we don’t have time to be healthy. Why we don’t have time to make real food for ourselves and our families. Why we can’t exercise. Why our bodies are tired and broken. The majority of people are becoming more tired, sicker and heavier. The food, medical & pharmaceutical industries are booming businesses, becoming wealthier every day. Lets think about this for a minute. How do you feel? How do your kids feel? Is it possible to make some small adjustments that will pay huge dividends in regards to the health of you and your family? Let me help you by sharing some of the things I have learned over the years. Disclosure: I’m not a nutritionist, registered dietician, health coach or have any certifications to my name. I’m a health & wellness enthusiast who has spent countless hours and dollars researching food and nutrition. Feel free to use any information provided to make the best life possible for you and your family. Know that nobody is perfect. That’s not the goal. 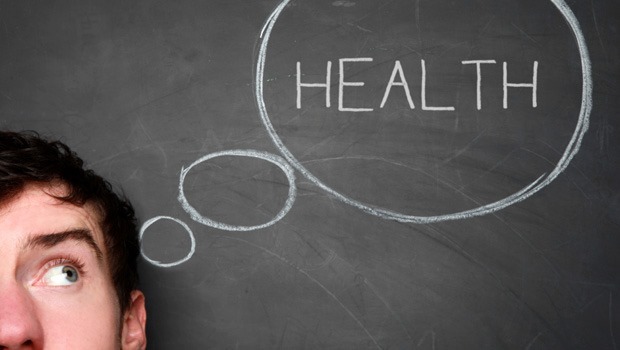 Overall health, making the best choices possible and FEELING GOOD is what’s really important. Side effects may include: weight loss, happiness, enhanced performance, more $$ in the bank for vacations, less $$ going out to healthcare. 1. Clean Proteins & Veggies. Most of my audience resides in the United States. Therefore, the majority of our food is contaminated with chemicals. Pesticides. Growth Hormones. Genetically Modified Organisms (GMO). Antibiotics. Etc, etc. Although we’ve been told our entire lives that these “additives” are not harmful to our health, there are studies that prove otherwise. Whether you agree or disagree about the necessity of “clean” foods, you may want to do some research on the topic. There is a reason why organics, “non GMO”, antibiotic/hormone free is now showing up on signs and packaging at the supermarket. What can you change? Read labels if you are buying processed foods. Look for ingredients that you recognize. Short, simple ingredient lists. Find your local Co-Op (click for a list of some co-ops per state, mine isn’t on there so list is not complete, just a reference) for clean foods and info on local farmers. Buy in bulk directly from the farmer. This may require investing in a chest type freezer for the garage but clean grass-fed beef, poultry, pork and wild caught seafood will go a long way to keep the family healthy. Local Farmers Market. While many of you may not frequent the local co-op for fresh veggies year round, most do have local Farmers Markets with seasonal fruits & veggies! Make it a weekly stop for the family. Let the kids pick out new fruits & veggies they have never tried! 2. Be prepared. Yes, FOOD PREP is a must! As life gets busier, the pizza delivery man knows most of us by first name. What kind of night is it? Pizza, Chinese, Fast Food? Let’s be honest. How many times a week do you eat or carry out food? Is it really necessary? Sometimes, yes. Most of the time, no. A little thought goes a long way. As I started this post, I went to my fridge to see exactly what I had prepped and ready to eat, now. Yes, like right now. Or within a minute or two of plating. This is what I pulled, ready to go from my fridge. I’m not even counting the leftover ham & mashed potatoes from last night, the chili from Super Bowl Sunday OR the pizza that hubby ordered on Monday while I was in Chicago for work. This is food I personally eat. Starting from left top: quinoa, ground turkey, roasted broccoli & asparagus. Left bottom: roasted sweet potatoes, shredded chicken, and two individual portions of sautéed veggies & turkey with 1 TBS avocado oil (full meal, ready for me to consume without any additional time unless I’d like to warm it up). My lunch from today is below. Chicken, broccoli & asparagus, all from above. Is that overwhelming? Probably as a whole, yes. But I’m a normal person too! I didn’t do this all at once. 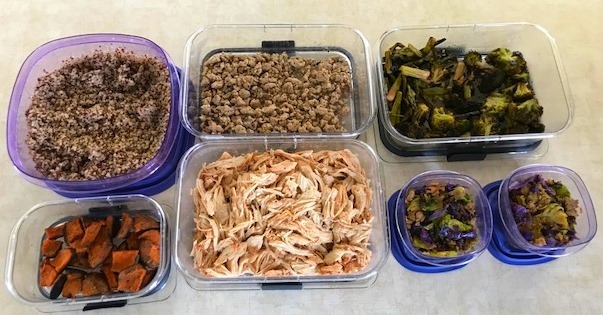 I don’t believe in “meal prep Sunday” where people spend an entire day prepping food for the week. It does not have to be that time consuming. 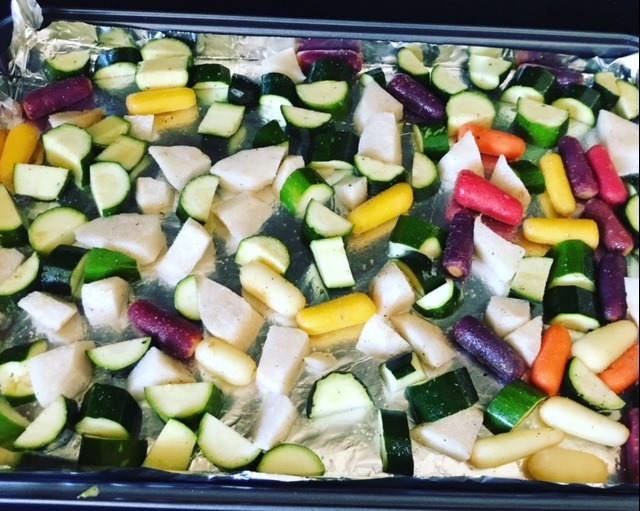 I toss in an XL baking tray of veggies when I notice I’m getting low on veggies. I’ll use whatever I have on hand. I like the colorful shortcut carrots, precut broccoli & cauliflower, brussels sprouts, zucchini, green beans. Really anything I can get easily. I buy in bulk at Costco. One giant bag of precut broccoli, yes please! I rinse, then toss on an XL baking sheet. Drizzle with Avocado Oil, Himalayan Pink Sea Salt & garlic powder. Mix by hand to coat veggies with a little oil/seasoning. In the oven at 410 for 30 minutes and walk away. Cut veggies pictured below. I cute up 3-4 zucchini (big chunks) & threw a bag of multi colored shortcut carrots on the baking tray. Probably took me 2 minutes once I had the zucchini cut & everything tossed with a little oil/salt/pepper/garlic. Yesterday, I threw a bag of frozen chicken in the crockpot on high. I added spices. Sometimes I add a jar of salsa. Sometimes, I use taco seasoning (non gmo, gluten free). Sometimes, I go with Italian spices. Cook on high a couple hours. Shut off. Let cool. Shred. If you aren’t home during the day, use a crock pot with a timer. Your crockpot can be your BEST friend when it comes to preplanning meals and food prepping. Over the weekend, I browned 2#s of turkey with a box of mushrooms & various spices. 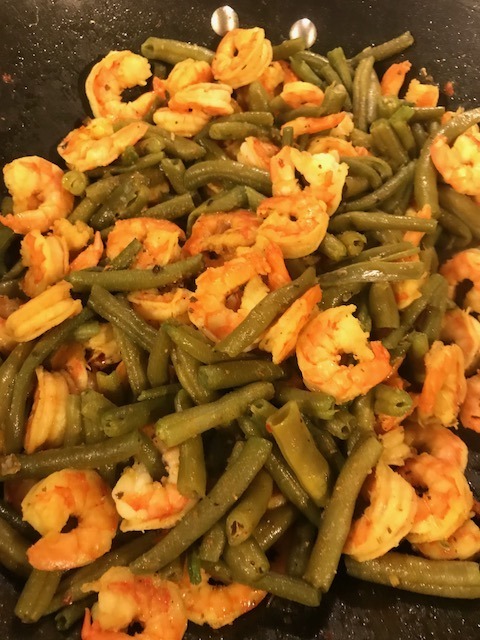 Last week, I dumped an entire bag of frozen shrimp (tails off!) 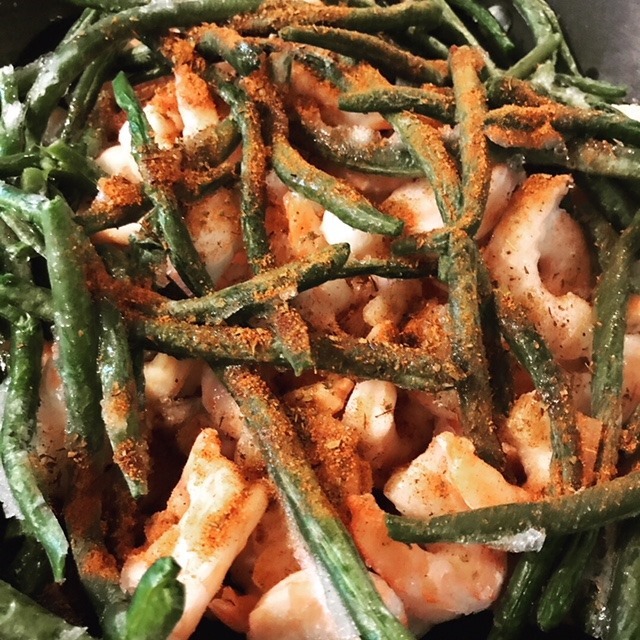 into a pan, added butter, lemon, Cajun seasons & a bag of frozen green beans. Let cook down, pour off liquid, put in a container for future meals. I cook in bulk. If I make stir-fry, I do 3x the veggies & protein that I want for one meal, then immediately divide upon cooking into containers for other days. I frequently do these things when I’m already in the kitchen cooking something for the family. Or when I’m making lunches. Time management. Use your time to the best of your ability. 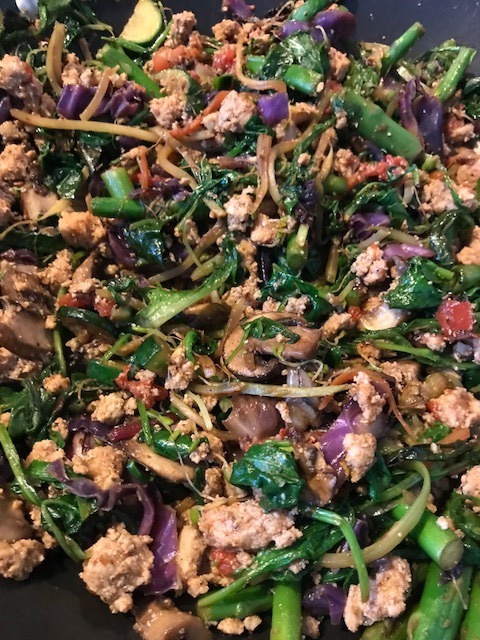 Stir-fry below: Various veggies & ground turkey (any protein will work, use whatever you have prepped in the fridge). Enough about food prep. I’m sure you get the picture. If you don’t already hate me because I’m firing the pizza delivery guy, then just wait! Ingredients matter. Look at the ingredient list. Can you recognize what’s listed? Can you recognize sugars & fake sugars alike? Did you know that women are only allowed 24g of added sugar per day (36g for men)? How many grams of sugar per serving? Did you know that ingredients are listed in descending order. Meaning the ingredient with the LARGEST quantity, is listed first. So if the first ingredient is xxxxbitol or xxxxulose, that means the biggest ingredient is a fake sugar. Be informed. Artificial anything in a shake or protein powder is not desired. Jane Doe may tell you that some of the deadliest things on Earth are found in nature. That is true! But at least I know what I’m up against (and not to eat it!). I don’t know or understand what that artificial ingredient, made in the lab, is going to do to my body. If it tastes like a milk shake, then it’s a milkshake. I’m tired of hearing complaints on the taste of a decent protein powder. Grow up. Clean up your diet. Cut the sugar. Then you’ll get your taste buds back and realize that real food actually tastes good. You shouldn’t need sugar, fake sugar and/or artificial flavors to be able to swallow food. This is about nutrition, what your body needs, YOUR health. 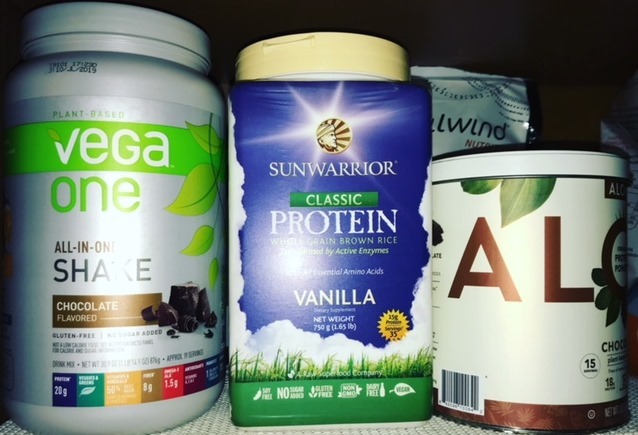 Some great protein powders that I’ve tried are below, these 3 are vegetable based (Vega One, SunWarrior, & Aloha – I have no affiliation with any of these products). 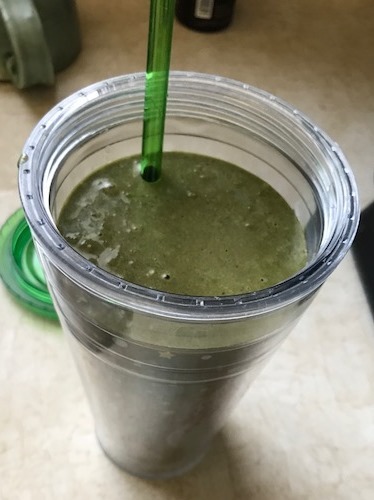 Also a peak at how my smoothies look. I change up the ingredients but they always taste great. My two favorites: 1 Scoop Chocolate Protein, 1 TB Natural PB, 2 Handfuls of spinach, Ice, Water. 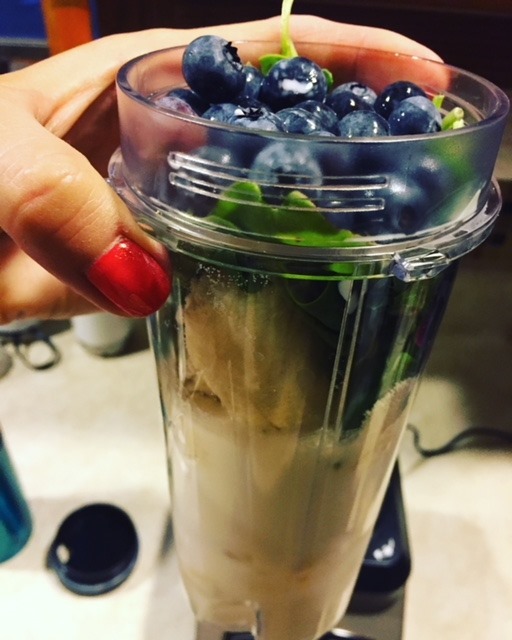 Or 1 scoop Vanilla Protein, 1/4 cup blueberries, 1 TB Coconut Oil, 1-2 Handfuls of Spinach, Dash of Cinnamon, Ice, Water. 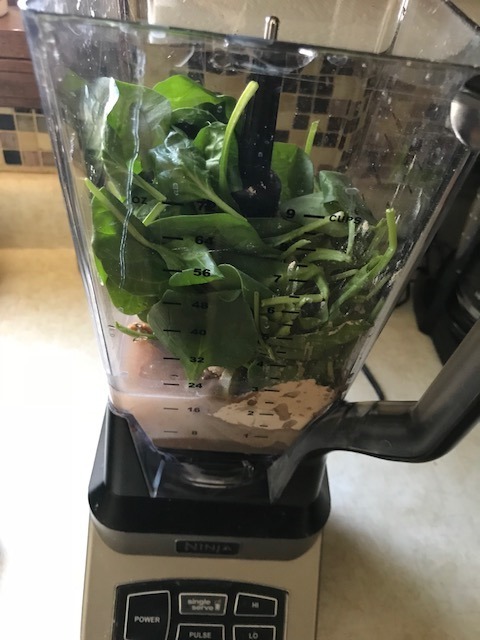 Both produce green smoothies but I can’t taste the spinach. I swear. If the green color grosses you out, try it with your eyes closed. Good, I promise! Fruit in your smoothie! Fruit is better than sugar, right? Yes. But fruit converts to sugar and some fruits are inflammatory. I’m not going to tell you to never eat a banana but if you are looking for weight loss as a side effect of your healthy eating, then you need to drop the banana & grab the blueberries. 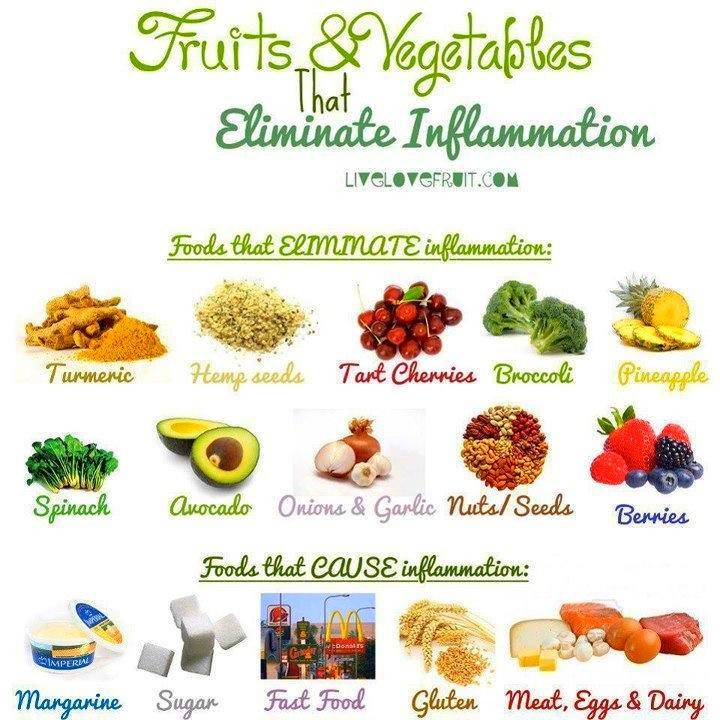 See the list of anti-inflammatory foods below from LiveLoveFruit. Inflammation may lead to Heart Disease, Cancer, Diabetes, Anxiety, Allergies, Brain Fog & Excess body fat, to name a few. 4. Supplements. Another million dollar question. Do you need them? NOT a one size fits all answer. If you are eating a CLEAN, anti-inflammatory diet with lots of leafy greens, then you don’t need a lot of extras. A few items that may be beneficial, depending on your lifestyle are listed below. But once again, ingredients matter. Use reputable companies! D3 – I’m sure you’ve heard of the benefits of being outdoors in the sunlight? D3 is the answer if there is no sun. Some call it the “Sunshine Vitamin”. D3 can increases immunities, increase bone/joint/teeth health, regulate mood, help the absorption of calcium & phosphorous (imperative for bone health) & fight cancer. Probiotics – Healthy Bacteria! Focus is gut & immune health. Lots of natural probiotics so you don’t need to automatically grab for a capsule. Use active live culture yogurts (if you can do dairy), Keifir, Sauerkraut or Kimchi. You’ll specifically find the ever popular Kombucha missing from this list. It contains a small amount of alcohol which turns to sugar and its relatively controversial. Omega 3 – Commonly known as “fish oil”. Omega 3 is the ONLY Omega you need. Don’t get pulled into the supplements that offer 3, 6 & 9. Your body only needs “extra” of the 3. We get enough 6 in our diet. And our body makes enough 9 that we don’t need to supplement. Omega 3 helps to fight inflammation (and related diseases), helps improve cognitive function & brain health. I’ve also read that it’s good for skin health. If you eat a lot of fatty fish, like salmon, you can probably skip this one. Its also found naturally in nuts & seeds. Magnesium. If you’re an athlete, have trouble with constipation, get frequent headaches, have PMS cramps, or you can’t sleep, then Magnesium might be your new best friend. Magnesium comes in a couple different forms. Magnesium Citrate is what you want if you are constipated. Magnesium Glycinate is what you need for everything else: help getting to sleep, help in muscle repair, headaches, eye twitches, PMS cramping, sore or twitching muscles from physical activity, and it helps calcium absorb. Its also reported to help with anxiety and increase energy. If I only had one supplement in my cabinet, it would be magnesium. You can combine the Magnesium Glycinate & the Magnesium Citrate to get the desired result(s). I don’t know about you but my brain is about ready to explode. That’s all I can personally process for one post. That’s probably MORE than most can process at one time, if they haven’t been studying this stuff for a long time. BUT, I wanted it all here, for reference. You may also be interested in some of my related articles below. My level of education on nutrition has increased over the years but one thing remains, passion. I’m passionate about being healthy. Learning as much as possible. And living the best life I am able. I know this isn’t easy, especially if you work, have kids, and are busy. But its worth it. I wish each and every one of you the HEALTHIEST life possible. A Matter of Healing …. 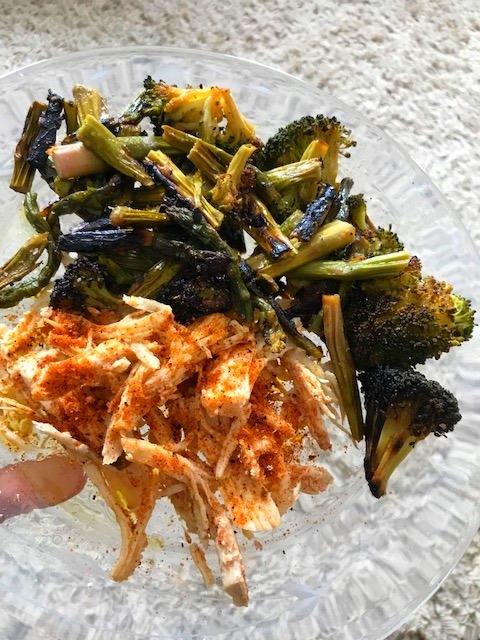 This entry was posted in Family, Fitness, Healthy Eating and tagged Anti-Inflammatory Diet, Clean Eating, Farmers Markets & Local Co-Ops, Food prep, Good Ingredients, Good Protein Powders, Good Smoothies, Healthy Eating, Probiotics, Sugar & Chemicals in Food, Supplements by tootallfritz. Bookmark the permalink. Nice post on subject and no big deal you not an “experts” and speak from your “personal experience”…but discover all the time more “angles” that may or may not be critical if orangic or not…the one recent angle seeing bent on GI micro-flora and what you eat that supports various micor-flora in the gut…some the “good” ones…others the “bad” ones. Thinking more of Dr. Gundy’s portrayal of GI micro-flora and what that mix does in sending neuro-transmitters to brain to fuel your eating patterns. He focuses on “pre-bitotics” that feed and nurture the so-called positive gut flora vs those that favor the “negative” gut flora that promote gas and bloating. Not entirely convinced…but I think this man on to something in internal, gastro-intestinal dynamics of the human intestine that yields positive or negative health impacts. Warning…it is all bent on buying his “pre-biotic” supplement…but I am going to give it a try…as at age 64…got nothing to loose. 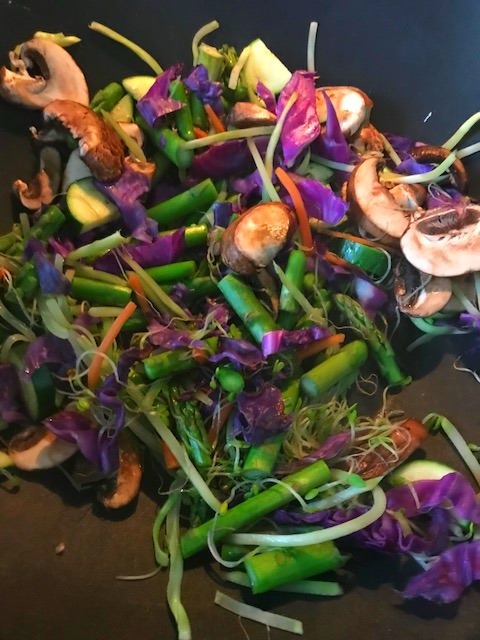 The research I saw he cited…supports there is a basis for his approach…the GI flora is what sends neuro-transmitters to your brain that you eventually act on to “feed” the specific species of fauna that live in your gut. He doesn’t favor foods that are based or high in “Lectins” which includes tomatoes and peppers and such. Need to research this more…but I think approach may have promise…especially for those…suffer from GI-issues!